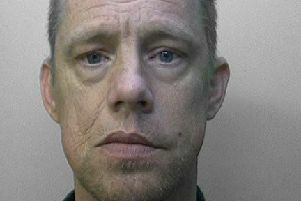 A Sainsbury's shop manager needed hospital treatment after being assaulted in a Brighton store, police said. Sussex Police released a CCTV image of a man in connection with the assault in Sainsbury's, North Street. Police said the suspect was challenged by the manager at Sainsbury’s in North Street, who suspected he may have been shoplifting. After searching him, the suspect became aggressive and punched the victim in the face several times – requiring hospital treatment – before he made off from the scene, police said. During the melee the suspect dropped a black mobile phone, however it did not contain a SIM card and had not been set up. The suspect is described as black, about 5’10”, with black hair and facial hair, and was wearing a grey hoody, tracksuit bottoms, and grey/white trainers. He was also carrying a black backpack. The incident occurred about 7.15am on Wednesday, July 4, and police said it is unknown if the man stole anything. Anyone who recognises the man or who saw what happened is asked to report it online or call 101, quoting serial 212 of 04/07.